A SpaceX Falcon 9 rocket filled with small satellites launching from the Vandenberg Air Force Base in California on Monday. At 10:34 a.m. PT (1:34 p.m. ET) today, and under clear blue skies, a Falcon 9 rocket blasted into space. The otherwise unremarkable launch was notable and record breaking for four distinct reasons. First, it was SpaceX’s 19th launch of the year, topping its previous annual record of 18, which was set last year. Second, the Falcon 9 rocket managed to deliver 64 satellites into orbit at once—a record for the United States (India holds the world record for a batch satellite deployment, launching 104 satellites at once in 2017). Third, the reusable booster used today, known as B1046, became the first Falcon 9 first-stage rocket to be used for three separate launches, with the prior two occurring on May 11 and August 7 of this year. 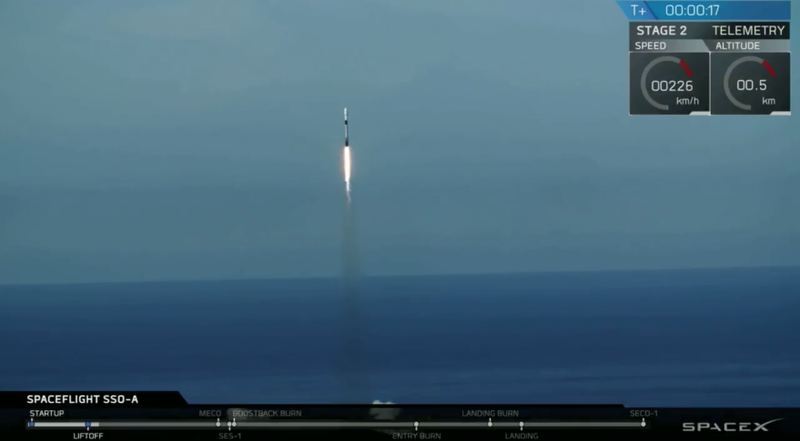 Finally, and in another precedent, this same booster has now launched from all three of SpaceX’s launch pads: Kennedy Space Center’s pad 39A, Cape Canaveral Air Force Station Launch Complex 40, and now the Launch complex 4E at Vandenberg Air Force Base in California, as reported by Florida Today. Not bad, SpaceX, not bad. But in all fairness, the private rocket company had some help; its sole customer for this mission, SpaceFlight Industries, purchased exclusive access to the Falcon 9—the first time SpaceFlight Industries has done such a thing, as CNN reports. Today’s simultaneous launch of 64 satellites points to the trend toward more compact, inexpensive satellites, and the declining need for heavy rocket power. Today’s mission, dubbed the SSO-A: SmallSat Express, included 15 “microsats” and 49 “cubesats.” Over 34 different public and private organizations were involved, from 17 countries, including the United States, Australia, Canada, Italy, Poland, and others. Spaceflight Industries packed the 64 satellites into a 20-foot-tall payload stack, which was divided into two parts. In a statement, the company described it as “one of the most intricate endeavors” it has ever undertaken. With SpaceX taking responsibility for the launch of the Falcon 9, Spaceflight Industries handled “all the mission management planning, engineering, integration, mission assurance and system engineering processes, regulatory and policy procedures, contracting, and business development for the mission,” the company said in a statement. When the Falcon 9 reached space today, its nose cone fell away, and the satellites began to emerge. Among the satellites crammed into the payload stack was an Australian-built device that will connect remote devices to the internet, a pair of SkySats from Planet, and two satellites—one from the U.S. and one from Finland—that’ll be used to track planes and ships. The rocket also deployed an experimental astrobiology satellite developed by a group of middle school students from Florida, CNBC reports. The B1046 reusable booster managed to land successfully on a droneship after the launch, but the landing of the payload fairing didn’t go as planned. The fairing—a cone-like structure that protects satellites, equipment, food, and other items during the journey into space—was supposed to be caught in the netting of a recovery vessel known as Mr. Steven. Instead, it landed on the ocean, a development that didn’t seem to phase CEO Elon Musk. Indeed, hard to be upset after such a successful day. Correction: An earlier version of this post incorrectly identified the developer of the SkySats.